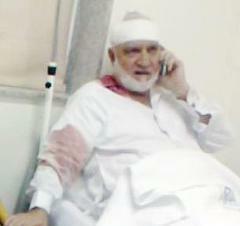 Shaykh Usama Al-Rifa'i in hospital after mosque assault, 2011. On Saturday, August 27, during special night-time prayers held during the Muslim fasting month of Ramadan, Syrian soldiers and club-wielding gangs encircled the large Al-Rifa'i Mosque in Damascus and then attacked it, killing two people and wounding 12, according to the Local Coordinating Committee, a body representing the protestors against the regime of Bashar al-Assad. The structure is also called the Kfar Susseh mosque because of its location in a quarter of Damascus with that name. The mosque leader, Shaykh Usama Al-Rifa'i, who is more than 80 years old, was assaulted with sticks in the melée, and left with his head and hand injured. A foreign website shows the shaykh in bed at the Andalusia hospital in the city. Shaykh Al-Rifa'i, prominent in the Syrian Sunni religious leadership and a spiritual Sufi known in many countries, tried to negotiate with the assailants to allow the congregants to leave the mosque safely, but regime forces overwhelmed the large building. YouTube videos posted here and here show violence by armed men inside the mosque as well as the aftermath of the aggression. In the latter, an apparently dead man is carried away by members of the Red Crescent Society, the equivalent of the Red Cross in Muslim countries. Shaykh Al-Rifa'i is said to be one of 19 prominent Sunni religious scholars in Damascus who signed a petition against the regime's repressive actions on the eve of the commencement of Ramadan. The text of the petition has not been made public. On June 17, as transcribed by the Middle East Media Research Institute (MEMRI), Shaykh Al-Rifa'i denounced Assad's regime in sharp terms in a Friday sermon. He declared, "The harsh and brutal treatment, by the security forces and the army, of whoever goes on a peaceful demonstration, or any other demonstrations. … We see their brutality, and we see them shooting live bullets, leaving a trail of casualties and lost lives, and shedding much blood. ... Every day, we lose many martyrs from among our people, and along with them, we are gradually losing the blessing of security." Al Rifa'i then asked, "Who sent these people to demonstrate? Was it America? France? Britain? Bouazizi in Tunisia, who reached the point where he set himself on fire in front of all the people—was it America or the Western conspiracies that drove him to do so, or was it unbearable injustice that drove him to this act? "The same holds true for the peaceful demonstrations, which were waged in order to make demands that are legitimate, as admitted by even the officials in our country. These demonstrators were not sent by the East, by the West, by conspiracies, or by armed gangs. They took to the streets because of the injustice." The mosque invasion on Saturday was condemned by the Association of Syrian Islamic Scholars, which operates from outside the country. In its statement, the Association called on religious leaders who had met with Assad to "support the Islamic scholars defending freedom, and denounce the terrible crimes committed by the regime ... [and] the humiliation of the Syrian people." The association appealed to all Muslim clerics and intellectuals to prevent further violations of human rights. The association, along with another prominent Syrian Islamic scholar, Muhammad Ratib al-Nabulsi, linked the attack on the Al-Rifa'i mosque with the beating of cartoonist Ali Farzat, whose hands were broken by regime thugs last week in response to his caricatures aimed at Assad.